Endoscopic spine surgery is receiving intense interest as minimally invasive techniques, robotics and biologics are the latest focus in spine care that is embraced by a myriad of providers, all touting their area of expertise as the answer to treating painful conditions of the spine. All stakeholders agree that if non-surgical methods of treatment are effective, the natural adaptation of painful degenerative conditions will eventually be mitigated or resolved with some modification of work or activities of daily living that avoids aggravating the clinical condition or delays a rapid advancement to a painful condition. Each stakeholder in the treatment spectrum is touting, and marketing their areas of expertise, but few stakeholders work together in a truly multidisciplinary and cooperative agenda. Procedural or surgical interventions are easiest to market and to measure its efficacy and cost effectiveness. The cumulative cost of spinal care is, however, becoming less affordable as spinal care does not follow the economics of a free market since increased consumption and availability does not result in decreased cost as an economic model. There is a need for cooperation and a focus on the diagnosis and treatment of common painful conditions of an aging spine, starting with common back pain that affects tens of millions of patients. Back pain is one of the most costly and debilitating conditions universally affecting work productivity. In the United States and in industrialized countries, new procedures for back pain tend to “follow the money” aided by industry. In Asian and OUS countries, there is more acceptance of traditional non-surgical treatment from thousands of years of medical treatment history. New and non-traditional treatments based on evolving science, are being made readily available in the information highway by Open Access Journals where researchers can publish their Level V evidenced based concepts for interested parties and other scientists. Anthony T. Yeung’s work focuses on the surgical treatment of the pain generator in the lumbar spine. Patient selection is aided by using diagnostic and therapeutic injections, to identify the likelihood of surgical success when the pain source is targeted. This article focuses on the details of Yeung’s 27 years’ experience on identifying and treating the pain generators in the lumbar spine by an endoscope and combined with an endoscopic system that he has trademarked the Yeung Endoscopic Spine System (YESSTM). Endoscopic transforaminal percutaneous lumbar surgery is the least invasive surgical approach to the lumbar spine. It has been generically called “percutaneous lumbar endoscopic decompression” or (PELD). This article describes the Yeung technique for transforaminal percutaneous decompression which is labeled “Selective Endoscopic Discectomy” (SEDTM). 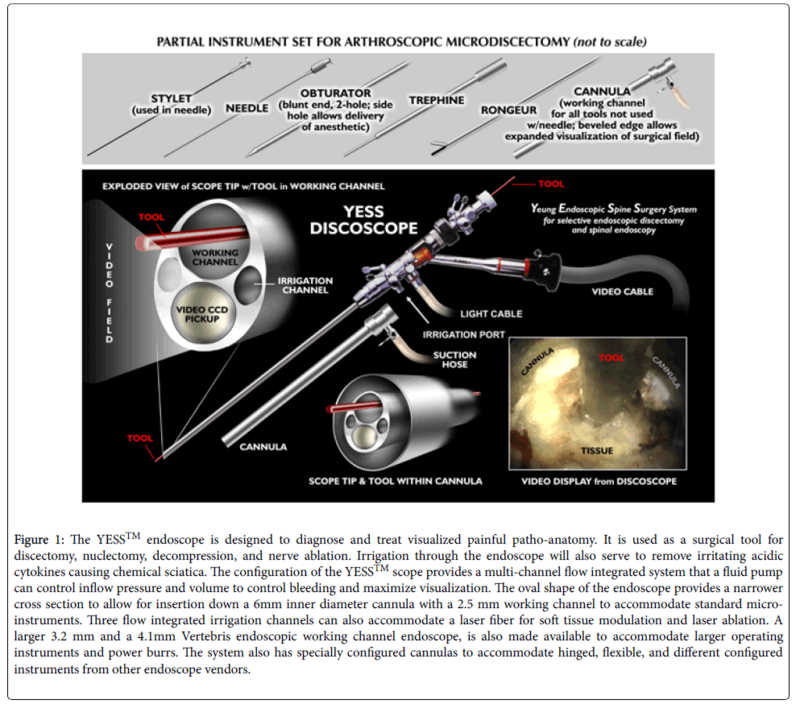 Other techniques, marketed by multiple endoscopic companies exist, but the YESSTM technique t is specifically described for those endoscopic surgeons electing to follow Yeung’s teaching. The philosophy and technique are important, like the different styles of martial arts that emphasize philosophy as well as technique for best results. The emphasis on targeting the pain generator by direct endoscopic visualization makes it also the safest of the transforaminal techniques [1,2]. The first critical skill to learn is needle placement using the posteroanterior (PA) view fluoroscopy, aided by proper patient positioning on a radio-lucent table. Coordinates are drawn on the skin to guide the needle for a postero-lateral trajectory to reach the patho-anatomy inside the disc as well as the epidural space. The floor provides the horizontal axis and a PA trajectory perpendicular to the floor is the Yaxis [3-5]. The PA trajectory is then adjusted with a “Ferguson” or “Reverse Ferguson” angle to project the inclination of the disc angle referencing the endplate of the cephalad or caudal disc. Using the best trajectory for needle, cannulas, endoscope, and surgical instruments is important to access the patho-anatomy with mobile cannulas. For each patho-anatomic lesion, different decompression techniques may be championed by various “key opinion leaders”. The techniques can be summarized as the “inside-out”, “outside –in” or “targeted” for transforaminal endoscopic decompression. No one technique fits all pathologies to be surgically addressed, nor in any desired sequential order. Successful elimination of pain by decompressing and ablating the pain generator that minimize complication risks, however, will serve to showcase the safest endoscopic decompression technique based on surgical visualization . All surgeries will have complication risks that must be accepted by the patient. The YESSTM method in Yeung’s opinion, is the safest surgical intervention because of the emphasis on visualization and the use of local anesthesia. Full endoscopic spine surgery utilizing the transforaminal approach or translaminar approach along with the time honored open approaches are also appropriate and more easily accepted and adopted by traditionally trained surgeons. There will always be risks for all surgical procedure that must be recognized and accepted by patients and surgeons alike [7,8]. There are different spine endoscopes and surgical instruments marketed by competing vendors. A modular system, will allow the endoscopic surgeon to avail themselves to all vendors and their systems. A true minimally invasive approach to normal or painful pathoanatomy should provide access to the patho-anatomy without damaging or affecting normal anatomy such as muscle, ligament or bone that provides stability and function to the lumbar spine [9-12]. The transforaminal approach to the lumbar spine requires a safe trajectory but recognizing the limitations of each approach is also important. Some surgeons utilize a “full” endoscopic approach by supplementing the transforaminal approach with a translaminar approach through an 8-16mm cannula that can use an endoscope or other means of magnification. An endoscopic or mini open approach provides similar results that is less invasive, but visualization is important regardless of the approach or method used. Even for experienced endoscopic surgeons, all providers will go through a relatively steeper and longer learning curve for the transforaminal approach than the “full endoscopic” approach favored by Dr. S. Ruetten because surgeons are more familiar with translaminar anatomy [13-18]. Ruetten utilizes the translaminar approach 80% of the time using general anesthesia. Yeung, however, has mastered the transforaminal pathway with his techniques of foraminal, facet, and pedicle decompression that also emphasizes intradiscal therapy as part of his “inside out” technique. The disc is the common denominator for pain generation from micro-trauma or aging. Yeung addresses approximately 90% of painful conditions of the lumbar spine through the transforaminal approach, even if a translaminar approach may be easier and more familiar to a traditionally trained surgeon to target the patho-anatomy [19,20]. Once the surgeon becomes very experienced and technically proficient, surgical time is better attained with the transforaminal technique. Success is defined as the clinical goal of improving or eliminating debilitating pain for the patient’s needs, but with the caveat that as the aging process will continue. More traditional open or more invasive procedures can still be considered without ‘burning any bridges” when using the transforaminal approach . In 2005, Yeung developed a visualized endoscopic dorsal rhizotomy technique through a tubular retractor. Endoscopic dorsal rhizotomy will augment transforaminal decompression as a hybrid procedure to help provide axial back pain relief from lumbar spondylosis and discogenic pain. Both dorsal and transforaminal approaches can access the branches of the dorsal ramus responsible for facet innervation . Yeung’s clinical experience and findings in greater than 10,000 procedures over 27 years is currently being mined and published in open access journals. His conclusions from a systematic review of his extensive database supports a transforaminal endoscopic approach as the most effective and least invasive method in experienced hands. Open decompression and endoscopic translaminar approaches are also appropriate and are dependent on surgeon preference and the individual “surgeon factor [23,24]. The results of surgical intervention with the endoscopic approach should at least provide equivalent results from open spine surgery, but with less surgical morbidity and faster post-operative recovery. It can also be considered efficient and economically viable for patients who desire or require pain relief without burning bridges with a more traditional and more invasive open surgical approach. It can also offer pain relief faster and earlier than nonsurgical methods. In instances where transforaminal decompression is incomplete, it does not burn bridges for a more traditional subsequent surgical transforaminal or translaminar approach. The patient can also resume a nonsurgical regimen such as physical rehabilitation. Indications are also dictated by the surgeon’s ability (the surgeon factor) to diagnose, access, and then eliminate the source of the pain by correctly interpreting the imaging studies and confirming the origin of the suspected pain generator. A favorable response to diagnostic and therapeutic injections and ease of access to the patho-anatomy will help predict a favorable response to endoscopic decompression that utilizes the same trajectory as the pre-surgical injection. Diagnostic and therapeutic transforaminal injections, even translaminar epidural injections, and “evocative discographyTM a term trademarked by Yeung, avoids the controversy generated by those who do not believe in or perform discography. The addition of an epiduralgram while performing the diagnostic transforaminal injection provides additional imaging correlation of the patho-anatomy for surgical decompression. Contraindications are relative, rather than absolute, and are dependent on the anatomic variations of normal and patho-anatomy in each individual patient. An example is extruded, up or down migrated HNP, and the extent of migration and sequestration relative to the size of the foramen. A high and narrow iliac crest may prevent transforaminal access unless a trans-iliac approach is used. Spinal deformities such as degenerative and isthmic spondylolisthesis can also be treated endoscopically if relatively stable. Decompression of the concave side of a scoliotic curve will depend on the stability of the scoliotic segment, since pain relieving decompression of the segment may result in further collapse of the segment and further compression of the lateral recess if instability is underestimated. If there is a syndesmophyte providing extra foraminal and interbody stabilization, especially in elderly patients, decompression of the axilla, leaving the stabilizing syndesmophyte in place, may make focused foraminal decompression successful. If there is a disc protrusion on the convex side, decompression of the convex curve will not destabilize the scoliotic curve. Even cauda equina syndrome, or conditions where the surgeon needs wide decompression to access the herniation translaminarly, can be addressed transforaminally first, especially if decompression or excision of the ventral obstruction causing cauda equina syndrome is also effective. In cauda equina syndrome, even if resolution of the impending emergency is incomplete transforaminally, the ventral decompression through the foramen under local anesthesia will facilitate translaminar decompression and make it less urgent, even if partially relieving emergent loss of bladder or bowel function is the goal. Subsequent open surgery will be less urgent and less surgically challenging. The surgeon’s experience, reflecting his skill and experience in accessing the patho-anatomy safely and efficiently is paramount to the ultimate success of the transforaminal surgical procedure. The novice surgeon should begin endoscopic decompression in patients which require only partial disc decompression to reduce intradiscal pressure, such as a small contained or soft protruded disc herniation in a patient with a tall disc and a large neuroforamen. Clinical scenarios involving extruded HNP, stenosis, calcified annulus, and impingement from facet pathology, should be attempted only after surgical proficiency has been achieved. In situations like this, decompressing the axilla between the traversing and exiting nerve is critical for the best surgical success. This area, known in the literature as the “hidden zone” is not normally visible to traditionally trained translaminar surgeons only experienced with translaminar techniques. Transforaminally decompressing impingement from scar tissue, thickened ligaments, and incidental synovial cysts provides symptom relief. Having the proper endoscope and complementary surgical tools is needed to perform the surgery expediently. It may often be the determining factor for surgical success or failure. The ideal endoscope design and configuration should be considered when purchasing an endoscopic spine system. The original YESS endoscope fits the ergonomics of an ideal system. It should be with an endoscope that fits inside a 6 mm inner diameter, 7 mm outer diameter cannula placed inside a degenerative, narrowed disc. The walls of the cannula will safely dilate a narrowed disc enough for insertion of the 4.5 mm YESS oval endoscope for intradiscal visualization. The patho-anatomy inside the disc is often under appreciated by traditional spine surgeons. Most narrowed discs can accept a 7 mm outer diameter cannula if the disc space is dilated by a 6 mm blunt obturator . Access to intradiscal patho-anatomy provides the surgeon the ability to perform selective disc decompression, with intradiscal therapy such as thermal annuloplasty, end plate decompression, or excision of disc embedded in the annular fibers that compromise annular integrity keeping annular fissures open, causing discogenic pain. A modular system gives the most flexibility, so instruments, cameras and video towers from different vendors could be interchangeable. The endoscope configuration and irrigation channels consisting of at least one inflow, but multiple outflow ports provide the best visualization. This ergonomic design was incorporated in the original YESSTM endoscope in 1997 with special instruments designed and manufactured by Richard Wolf under Yeung’s direction (Figure 1). Figure 1:The YESSTM endoscope is designed to diagnose and treat visualized painful patho-anatomy. It is used as a surgical tool for discectomy, nuclectomy, decompression, and nerve ablation. Irrigation through the endoscope will also serve to remove irritating acidic cytokines causing chemical sciatica. The configuration of the YESSTM scope provides a multi-channel flow integrated system that a fluid pump can control inflow pressure and volume to control bleeding and maximize visualization. The oval shape of the endoscope provides a narrower cross section to allow for insertion down a 6mm inner diameter cannula with a 2.5 mm working channel to accommodate standard microinstruments. Three flow integrated irrigation channels can also accommodate a laser fiber for soft tissue modulation and laser ablation. A larger 3.2 mm and a 4.1 mm Vertebris endoscopic working channel endoscope, is also made available to accommodate larger operating instruments and power burrs. The system also has specially configured cannulas to accommodate hinged, flexible, and different configured instruments from other endoscope vendors. Irrigation fluid devices with a pump to control pressure or flow volume, facilitate visualization by minimizing bleeding that obscures visualization. The fluid pressure is adjusted for each individual patient and kept under systolic BP but over diastolic pressure to control and minimize bleeding that obscures visualization. Few surgeons are aware of this feature of the YESS system. Special surgical tools, such as a Ho: Yag laser, will help ablate tissue or bone in tight spots. Bipolar Radiofrequency is the safest form for tissue modulation. Further development of articulating or flexible instruments and automated burrs is often the deciding factor for successful or unsuccessful surgery . Laser should not to be used as a marketing gimmick; however, when used appropriately, lasers facilitate surgery and improve surgical results. Unfortunately, many surgeons advertise laser in their practice but do not really use it as a surgical tool for surgical decompression, but more for marketing purposes. The multi-directional aspect of laser energy through various delivery probes provides surgical flexibility to access tight compartments and loosen embedded disc fragments in the annulus through a directed laser fiber. Different vendors have their own surgical tools that are also valuable adjuncts for surgical decompression, not available from any single vendor. The surgeon, for these reasons, should have these tools available to use with a modular system that can accommodate other brands of endoscopes and instruments. Probably the most frequent concern from traditional surgeons who avoid learning endoscopic surgery is radiation exposure and the need for fluoroscopy. With available radiation shielding available in the operating room, 85% attenuation of scatter radiation can be blocked. If precautions are taken by the surgeon and proper protective shields and equipment in the OR set-up is used, such as lead shields suspended from the ceiling, and shielding of table and positioning frames, radiation exposure is minimized to reasonably safe levels. With experience, radiation exposure averages less than 60 seconds per foraminal decompression case. The surgeon can also choose other approaches when it is just as beneficial for the patient, and save the approach requiring radiation exposure if the percutaneous endoscopic approach is the best option for the patient and surgeon [27,28]. Image guidance and robotic technology, used on other percutaneous procedures, may not be needed for lumbar decompression by surgeons with extensive experience but to bring transforaminal surgery to the average clinical spine clinician, Robotics will make its use safer and cost effective if it elevates the surgical ability of all providers of spine care. The future will be to facilitate the development of a robot using the artificial intelligence of experienced endoscopic surgeons and incorporating the “tricks and pearls” discussed in this manuscript. In today’s health care environment, the lack of formal training during residency or fellowship is a major obstacle to wide adoption of endoscopic surgery by spine surgeons. However, spine care providers such as pain management, interventional radiology, physical therapy and rehabilitation will possibly increase the demand for Robotic A.I. Even with appropriately surgically trained providers of spine care, pain physicians even with a multidisciplinary team working together or independently, will create demand for a robotics system by all involved [29,30]. Proper positioning of patients facilitates the surgical approach and provides more consistent trajectories of needles guide pins, and awls for the surgical placement of cannulas and instruments. Yeung prefers the prone position. A lateral position set up may be needed for morbidly obese patients (>350 pounds) and if only a uni-portal approach is required. The prone position is the most versatile and effective for several reasons. First, patients are typically more comfortable in the prone position when sedated, and less likely to move around during surgery. Second, imaging in the PA and lateral plane may be more reliable and more familiar to the surgeon . Using the floor as the horizontal plane and a true vertical plane perpendicular to the horizontal plane, visual adjustments can be easily estimated by the surgeon to adjust for ideal trajectories using just Carm imaging. A biportal approach is easily accomplished if needed for bi-portal access to both the right and left foramen when the condition is bilateral. 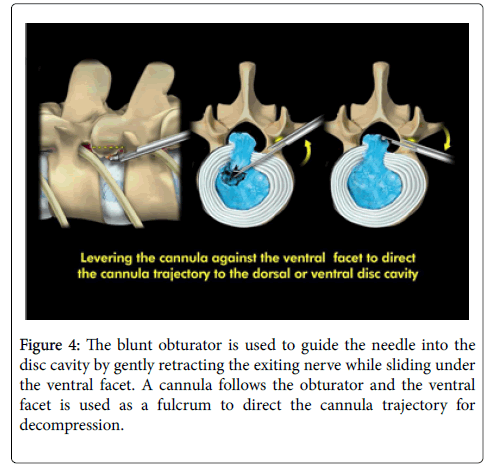 However, Yeung can decompress to the contralateral disc space with foraminoplasty, then advancement of the cannula inside the disc to the contralateral side by levering to a more horizontal trajectory, thus decompressing the bulging disc on the contralateral side. Yeung usually considers the lateral approach for morbidly obese patients since the abdomen will not be compressed and the lateral position will provide airway access for the anesthesiologist. The transforaminal approach is the most utilitarian approach for lumbar endoscopic surgery. It gives the surgeon the ability to visualize the neural elements by first accessing Kambin’s “safe zone”, then decompressing the tip of the superior articular process to reach the hidden zone in the axilla formed by the traversing and exiting nerve root. Kambin’s “safe” Triangle is not always safe, because of the variations or normal and patho-anatomy. The translaminar approach, however, may be more useful at the L5/S1 level where the interlaminar window is larger, thus, facilitating easier retrieval of extruded disc herniations located in the paracentral and epidural space. Extruded disc herniations at L5-S1 may prove difficult through a transforaminal approach in patients with a high iliac crest or a hypertrophic facet joint . In this case, a transiliac approach developed by endoscopic spine surgeon, Said Osmon, MD, can be considered. A transiliac approach is demonstrated to be safe and may be easier than the transforaminal approach to overcome an excessively high and narrow iliac crest. The trans sacral epidural approach is also being marketed, but the approach has been around for a long time and cannot be as effective for mechanical surgical intervention. The epidural approach through the sacral hiatus approach is considered more pain management than a surgical approach used primarily for inflammation mediated pain. Transforaminal endoscopic decompression procedures can be safely performed under monitored anesthesia where the patient is sedated and receives a combination of local anesthesia and short acting intravenous drugs such as fentanyl and Versed. Generous, but appropriate use of local anesthetics as well as verbal communication with a sedated patient in place of neuromonitoring is the most significant advantage using local anesthetic and mild sedation. Yeung tries to avoid the use of propofol. If a patient cannot tolerate even a needle stick on the skin, the patient’s pain threshold makes him a poor candidate for any surgery. Once the needle is in the foramen, local anesthesia will provide more than adequate anesthesia to allow the cannula to fenestrate the annulus and to perform surgical decompression. The surgeon’s ability to feel will provide “haptic” feedback to the surgeon. This is safer than a complete reliance on general anesthesia . Yeung had percutaneous decompression on himself for a complex degenerative lumbar condition of a multi-modal HNP, degenerative scoliosis, and grade 1 spondylolisthesis under local anesthesia without sedation. He requested his son, Christopher Yeung, MD, a fellowship trained spine surgeon trained by the senior Yeung, to perform the transforaminal surgery. The transforaminal technique taught successfully reversed the progressive radiculopathy of his painful, spinal condition herniation, which followed with a Coflex dynamic stabilization procedure as a staged procedure in lieu of fusion. Appropriate training is imperative, as this is not a “see one, do one, teach one” procedure. It will also require surgical experience for a welltrained spine surgeon to access his own surgical skills for given spinal conditions. Experience and repetition will provide the best learning experience. Operating with an accomplished mentor surgeon is extremely helpful to shorten and facilitate the learning curve. Percutaneous endoscopic decompression, even when safe access is obtained, requires adequate training to obtain the results of traditional surgery. Repetition will allow the surgeon to recognize patho-anatomy versus normal anatomy, such as furcal nerves versus foraminal ligaments. Simply being a good technician is not enough. A dilator with a side hole provided as an integral part of the original YESSTM system for needle anesthetization of the annulus and soft tissue in the path of the dilator is accomplished with this side hole. The strength and thickness of the dilator will actually make it safer to use the dilator manually to safely bluntly push the nerve out of the way. Using an awl from the MaxMore system is helpful to establish a safe trajectory hugging the ventral facet. The blunt obturator follows. The beveled and medium tang opening of specially designed cannulas can also be rotated toward the nerve or painful patho-anatomy until the wall of the cannula can then be rotated back into position for surgical decompression while the wall of the cannula now protects vital vulnerable nerves and painful anatomy . Unexpected situations can occur, and the first caveat is to know when to abort the procedure and when to recognize potential hazards during the procedure. Taking steps to avoid complications requires knowledge gained from experience and from situations where an experienced surgeon demonstrates counter measures such as controlling irrigation pressure or controlling bleeding with the multichannel flow integrated YESS endoscope. Visualization is important for safe surgical decompression. Determining the location of the skin window, annular window, trajectory of the cannula and surgical instruments will make the procedure easy or more difficult. A “perfect trajectory”, using the facet to ensure safe approach and leverage is desired (Figure 2). It is important for the learning curve of needle placement. 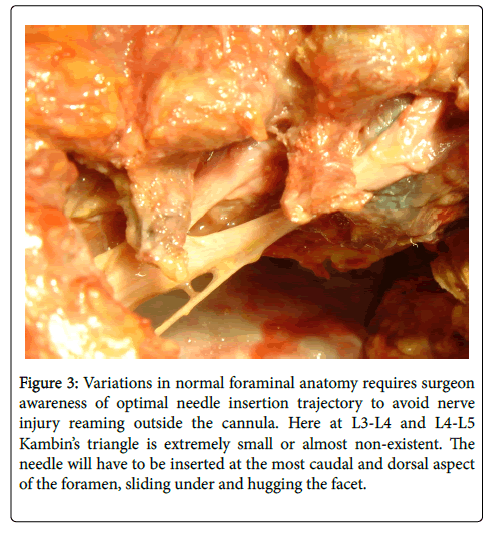 Foraminal and nerve anatomy varies, and even a “perfect” needle placement in the foramen does not always allow safe passage of the needle because of these variations in foraminal anatomy (Figure 3). 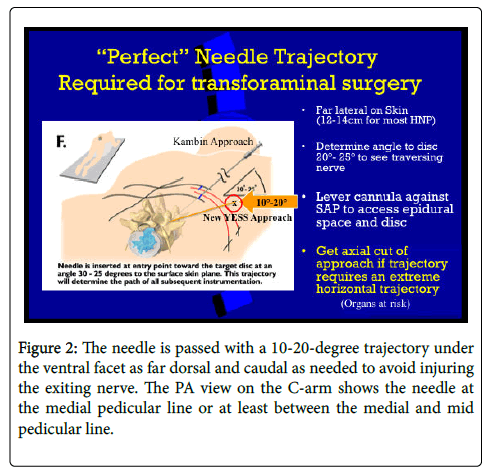 Figure 2: The needle is passed with a 10-20-degree trajectory under the ventral facet as far dorsal and caudal as needed to avoid injuring the exiting nerve. The PA view on the C-arm shows the needle at the medial pedicular line or at least between the medial and mid pedicular line. Figure 3: Variations in normal foraminal anatomy requires surgeon awareness of optimal needle insertion trajectory to avoid nerve injury reaming outside the cannula. Here at L3-L4 and L4-L5 Kambin’s triangle is extremely small or almost non-existent. The needle will have to be inserted at the most caudal and dorsal aspect of the foramen, sliding under and hugging the facet. The conscious patient serves as a dependable alarm system to ensure that nerve irritation is not caused by needle injury to the nerve. The blunt obturator can be used to guide the blunt instrument past the nerve while the outside wall of the cannula will retract and protect the nerve. Neuromonitoring has not been shown to improve results or decrease surgical morbidity when local anesthesia is used. Yeung’s study of patients with and without neuromonitoring when only local anesthesia is used confirmed this statement. Painful disc pathology is located in the foramen in the annulus, the facet capsule, and the posterior one-third of the disc space. Therefore, the operating tools are inserted from the skin window at a relative trajectory of 15-25 degrees in the frontal plane toward the foraminal annular window if it is desirable to enter the epidural space. The needle is docked on the annulus as close to the medial pedicular line as possible, but not medial to that line. The cannula will then be just ventral to the facet. The facet is used as a fulcrum to lever the cannula and surgical instruments to the dorsal annulus and epidural space or ventral to the lateral disc space (Figure 4). Figure 4: The blunt obturator is used to guide the needle into the disc cavity by gently retracting the exiting nerve while sliding under the ventral facet. A cannula follows the obturator and the ventral facet is used as a fulcrum to direct the cannula trajectory for decompression. To get the ideal trajectory, the patient’s facet may require decompression of the ventral facet to get more dorsal (Figure 5). The needle entry point is calculated from the PA and true lateral view of the lumbar spine. From the PA and lateral view, the skin window location is plotted. The combination of the skin window and the foraminal annular window determines the needle trajectory. This trajectory is adjusted more vertically or horizontally for the location of the patho-anatomy targeted. Figure 5: (a) Foraminoplasty will allow instruments to access the epidural space to either allow exploration for extruded and sequestered HNP or for foraminoplasty for lateral stenosis, a common cause of Failed Back Surgery syndrome; (b) Illustration of surgical foraminoplasty. The diagnostic value of intra-operative provocative response is valuable for confirming the disc as the source of the pain. Evocative chromo-discographyTM trademarked by Yeung, is a key clinical confirmatory test that links the suspected painful disc and the dye pattern to the patient’s subjective pain complaints. Pain is not always produced, but helpful in evaluating the patient’s pain threshold. Vital staining of degenerated nucleus pulposus and annular defects, using the diluted vital dye indigo carmine or even methylene blue in 10% concentration visually identifies pathologic portions of the disc in contained or uncontained herniations. Despite labeled warnings by pharma manufacturers, no adverse events in over 10,000 procedures has ever been attributed to the dilute vital dye used in small diluted quantities of 5 cc or less. With contiguous disc fragments in the epidural space, disc tissue embedded in the annular defects, and herniation tracts are also differentially stained or unstained. Non-ionic Isovue 300 contrast is mixed with indigo carmine in a 10:1 ratio. In a non-degenerated disc, the X-ray contrast agent permeates the nucleus pulposus and forms a compact oval or bilobular nucleogram. There is no dye penetration into the substance of the normal impermeable annular collagen layers. Therefore, the absence of an annulogram may represent a normal annulus. In degenerated conditions, clefts, crevices, tears and migrated fragments of nucleus will be filled with contrast both inside the disc and along the herniation tract. This vital staining helps guide the surgeon for decompression and thermal modulation. In contrast to controversial opinions of prominent “experts” in the literature, the use of discography is only controversial for those who do not know how to use it. An accomplished endoscopic surgeon uses chromo-discography for more accurate diagnosis and guided treatment of the patho-anatomy. Bail out for some procedures are discussed in detail in the pitfalls section. With percutaneous transforaminal decompression under local anesthesia, the procedure can be aborted at any stage of the procedure since no dissection requiring wound closure and suture is needed if the procedure is not proceeding as planned or anticipated. One uncommon complication that is simply handled is a dural tear. In Yeung’s series, it is less than 3%. A tear is not always avoidable since a herniated fragment may be adherent to the dura. If the tear is small, simply aborting the procedure will usually cause the dural tear to seal off from the operative site by auto-sealing of the defect by foraminal bleeding. The patient may not even have a post-op headache if the tear is small. If more decompression is needed, re-operation or approaching the disc from an alternative approach once the tear is healed can always be considered, but in Yeung’s series, it has never been needed. With larger visualized tears, a collagen patch through the cannula to the site of the tear with a duragen patch or flow-seal will compress and stop the leak and prevent extrusion of the rootlets of the cauda equina. If nerve rootlets from the cauda equina herniate from the tear, increase the pressure and flow of irrigation fluid if a fluid pump is utilized to push the rootlets back into the thecal sac. Yeung has never had to do an open repair of a dural tear. In one patient who appeared one month later with a pseudomeningocoele, the spinal fluid from the pseudomeningocoele was aspirated, and the dural tear visualized with the endoscope. A duragen patch followed by flowseal, successfully allowed the dural defect to heal without incident. The location is usually on the ventral or foraminal surface of the thecal sac and difficult to repair, therefore it is best to just tamponade the tear since there is no surgical cavity from surgical dissection. The most common pitfall is the advancement of the guide pin outside the confines of the disc. This can occur during the advancement of the dilator when the guide pin is pushed forward. Care must be taken to smoothly advance the dilator with a need to check the position of the guide pin with PA and lateral images during the advancement of the dilator to the annulus. As the obturator is being advanced, pulling back the guide pin while advancing the obturator and checking the guide pin position will prevent inadvertent advancement of the guide pin outside the confines of the disc space. Should the guide wire advance past the confines of the annulus, resist the temptation to pull the guide pin back and simply resume the procedure. This may lead to introduction of bowel bacteria into an otherwise avascular disc space and potentially lead to a postoperative wound infection. Therefore, the guide pin should be removed and discarded when any breach of the intra discal cavity is suspected. The second most common pitfall is to continue operating when the patient feels pain in spite of seemingly adequate intraoperative sedation and analgesia. It is better to abort the procedure if the reason for pain is not expected or cannot be avoided. Safe decompression is always painless. Knowledge of variations of three dimensional foraminal anatomy is imperative. The most significant structure in harm’s way is the exiting nerve. Injury to this nerve can be avoided by learning how to navigate the needle to the facet capsule as dorsal and caudal as possible until the needle enters the foramen and docks on the annulus. A blunt dilator can then push the nerve out of the way with manual manipulation, followed by insertion of the operating cannula with its beveled end facing the nerve, then rotating the cannula to protect the nerve as it slips past the exiting nerve. For this reason, Yeung cautions the use of reamers or surgical instruments outside the cannula (as promoted by the Thessys procedure) without visualization. The surgeon must be able to use patient and manual pressure feedback when he uses the dilator to first retract the nerve by pushing it out of the way with the blunt dilator, then use a beveled or tang extension cannula with the open or beveled end sliding over the dilator facing the nerve (Figure 6). 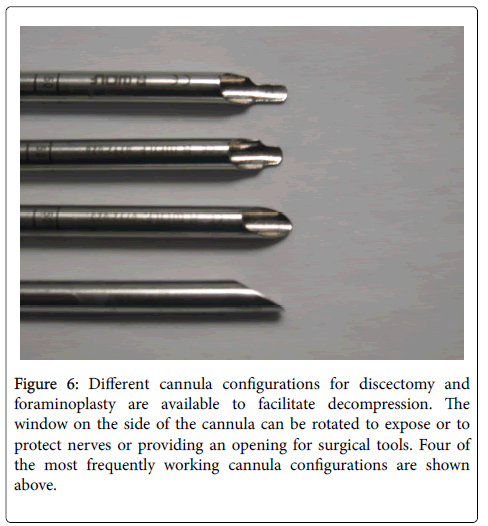 Figure 6: Different cannula configurations for discectomy and foraminoplasty are available to facilitate decompression. The window on the side of the cannula can be rotated to expose or to protect nerves or providing an opening for surgical tools. Four of the most frequently working cannula configurations are shown above. Once the cannula is past the nerve, it can be rotated, placing the nerve outside the cannula wall, protecting the nerve while decompression is performed inside the cannula. The patient may also feel radicular pain while the disc is being dilated with the obturator or cannula. Collapsed discs should not be “over expanded” or needed to restore “normal” disc height. When the patient has severely collapsed discs, restoring disc height can produce stretch injury and pain from the traversing nerves bilaterally during the dilation process and be exhibited clinically as radicular pain. The author has experienced this phenomenon on himself when he had transforaminal decompression of his degenerative scoliosis under local anesthesia and without sedation. Therefore, excessive indirect decompression by increasing disc height may have adverse consequences. With foraminal decompression, simple stabilization after decompression is more effective. The surgeon should be able to see to operate. The exception is when surgery is performed intradiscally and with fluoroscopic control. Occasionally, bleeding from the annulus and epidural space obscures visualization. If this occurs, advance the cannula inside the disc and use the “inside –out technique” to decompress the disc, then slowly pull the cannula back while controlling bleeding with a bipolar radiofrequency probe (Figure 7). 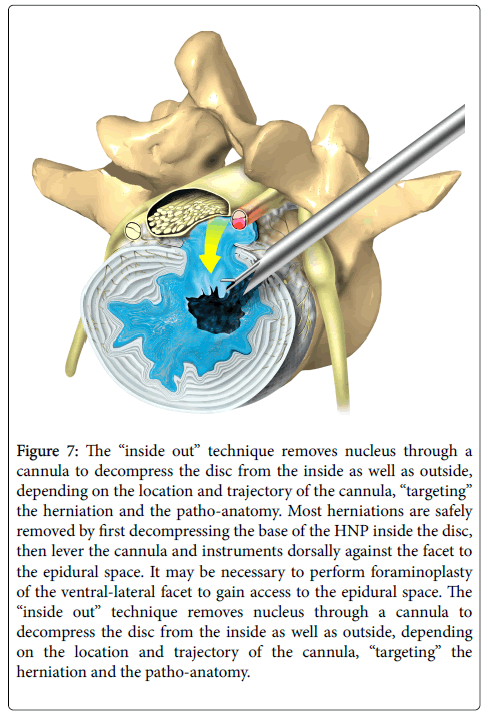 Figure 7: The “inside out” technique removes nucleus through a cannula to decompress the disc from the inside as well as outside, depending on the location and trajectory of the cannula, “targeting” the herniation and the patho-anatomy. Most herniations are safely removed by first decompressing the base of the HNP inside the disc, then lever the cannula and instruments dorsally against the facet to the epidural space. It may be necessary to perform foraminoplasty of the ventral-lateral facet to gain access to the epidural space. The “inside out” technique removes nucleus through a cannula to decompress the disc from the inside as well as outside, depending on the location and trajectory of the cannula, “targeting” the herniation and the patho-anatomy. Adjusting the flow and pressure with the irrigation pump is also helpful. If bleeding continues after visually guided decompression is complete, just let the blood flow out to the skin and the bleeding will eventually stop by normal tissue pressure. The wound will stop bleeding from tissue swelling around the access portal. Occasionally, a catheter can be inserted into the wound with or without a hemovac. When performing foraminoplasty, especially in and around the DRG, post-op dysesthesia, usually delayed, may occur 15-20% of the time with foraminoplasty for severe stenosis necessitating the decompression of the axilla. A recent 10-year review of Yeung’s endoscopic cases has decreased the overall incidence to less than 5%. Never the less, surgery can never be risk free. Provide a transforaminal epidural steroid block as soon as the dysesthesia is recognized and offer it to the patient. Combining the epidural block with a sympathetic block is very effective. Often the patient will decline the recommended block, indicating that the dysesthesia is not severe, and the patient only needs some reassurance that the dysesthesia will resolve over time. Prescribing gabapentin (Neurontin) or pregabapentin (Lyrica) helps. Usually one to three transforaminal epidural blocks will provide rapid relief. If there is severe skin sensitivity, adding a sympathetic block to the transforaminal block is most effective. Yeung uses betamethasone 2 cc mixed to 2-3 cc ¼% Marcaine for the transforaminal epidural block and 15-20 cc 0.5% xylocaine plain for the sympathetic block. Using depomedrol and 0.5% Marcaine will provide longer lasting relief and can be used safely if the use of nonionic contrast does not demonstrate any vasculature uptake. Patient reassurance is also important. Weakness and foot drop is rare, but can never-the-less occur, and is always a surgical risk, especially with foraminoplasty. Just the need to retract the nerve for decompression, even with a tubular retractor can cause weakness that is usually temporary. If the patient seeks further surgery by surgeons not familiar with endoscopic surgery, additional surgery has been shown to make his or her condition worse. Hematomas can occur, but tissue dilation will provide limited dead space for the hematoma to form. The exception is a rare occurrence of a retroperitoneal or an epidural hematoma. The patient may describe post-op back or flank pain. Bleeding caused by surgical decompression, however, is usually observed immediately since the blood will escape through the cannula. Other conditions such as vascular aneurysms can produce bleeding not related to the surgical procedure, especially if the patient has high blood pressure or on blood thinners. Endoscopic percutaneous transforaminal decompression is a fluoroscopically and endoscopically visualized method for minimal access to the disc, foramen, and epidural space that avoids surgical morbidity to the dorsal muscle column. This endoscopic approach also allows for the visualization of foraminal and intra-discal pathology that is not seen by the traditional dorsal translaminar approach. The ability to visualize these patho-anatomic sources of pain may open the door to better understanding the degenerative process and pain generators, thus adding to the surgical armamentarium of surgical intervention. Patient selection earlier in the painful disease process may evolve as well, preventing or mitigating a more serious condition requiring more invasive and more surgically destructive surgery. The surgeon will learn technical maneuvers to advance surgical cannulas and instruments in an approach and manner that protects normal anatomy and exposes bone or soft tissue requiring decompression. Once the surgeon masters this technique, it will be his or her first favored approach option for decompressing the disc, foramen and epidural space in the lumbar spine. Gore S, Yeung AT (2014) The “inside out” transforaminal technique to treat spinal lumbar Pain in an awake and aware patient under local anesthesia: Results and a review of the literature. Int J Spine Surg 8: 28. Yeung AT, Gore SR (2011) In-vivo endoscopic visualization of patho-anatomy in symptomatic degenerative conditions of the lumbar spine II: Intradiscal, foraminal, and central canal decompression. Surg Technol Int 21: 299-319. Yeung AT (2007) The evolution and advancement of endoscopic foraminal surgery: One surgeon's experience incorporating adjunctive technologies. SAS 1: 108-117. Yeung AT, Yeung CA (2007) Minimally invasive techniques for the management of lumbar disc herniation. Orthopedic Clinics of North America 38: 363-372. Gore SR, Yeung AT (2003) Identifying sources of discogenic pain. Jour Minimally Invasive Spinal Technique 3: 21-24. Yeung AT, Tsou PM (2002) Posterolateral endoscopic excision for lumbar disc herniation: surgical technique, outcome, and complications in 307 consecutive cases Spine 27: 722-731. Yeung AT, Gore SR (2001) Evolving methodology in treating discogenic back pain by Selective Endoscopic Discectomy (SED) and thermal annuloplasty. Journal of Minimally Invasive Spinal Technique 1: 8-16. 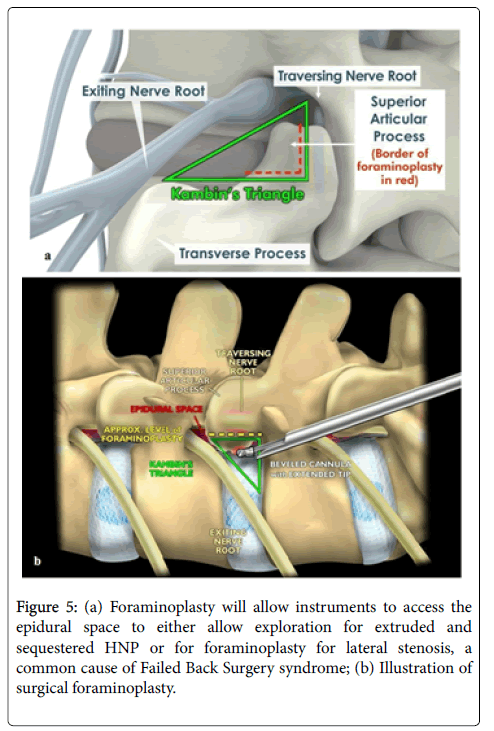 Yeung AT, Gore S (2014) Twenty-three years of experience with percutaneous transforaminal spine surgery: It’s evolution, the painful conditions treated, results, personal thoughts, and a review of the evolving literature. Surg Tech Int 25. Yeung AT (2015) Moving away from fusion by treating the pain generator: the secrets of an endoscopic master. J Spine 4: e121. Weiner R, Yeung AT, Garcia MC, Perryman TL, Speck B (2015) Treatment of FBSS low back pain with a novel percutaneous DRG wireless stimulator: pilot and feasibility study. Pain Med 17: 1911-1916. Yeung AT (2016) Intradiscal therapy and nucleus augmentation as a surgical technique for the treatment of common and chronic low back pain. J Spine Neurosurg 5: 6. Yeung AT (2016) Endoscopic decompression, foraminalplasty and dorsal rhizotomy for foraminal stenosis and lumbar spondylosis: A hybrid procedure in lieu of fusion. J Neurol Disord 4: 322. Yeung AT (2016) Intradiscal therapy and transforaminal endoscopic decompression: Opportunities and challenges for the future. J Neurol Disord 4: 303. Tsung-Jen H, Ki-Tack K, Nakamura H, Yeung AT, Zeng J (2017) The state of the art in minimally invasive spine surgery. BioMed Research International. Yeung AT (2017) Transforaminal endoscopic decompression for painful degenerative conditions of the lumbar spine: a review of one surgeon’s experience with over 10,000 cases since 1991. J Spine Neurosurg 6: 2. Anthony TY, Christopher AY (2017) Selective endoscopic lumbar discectomy (Sed™) and thermal annuloplasty for discogenic back pain, disc hernia­tions and sciatica in high performance athletes and physically active patients. Sports Injr Med 2017: 110. Yeung AT (2017) Robotics in the MIS spine surgery arena: A new role to advance the adoption of endoscopic surgery as the least invasive spine surgery procedure. J Spine 6: 374. Yeung AT (2017) Failed back surgery syndrome: endoscopic documentation of common causes by visualization of painful patho-anatomy in the hidden zone of the axilla containing the dorsal root ganglion and salvage treatment of neuropathic pain with drg neuromodulation. SF J Neuro Sci 1: 1. Zhang X, Du J, Yeung AT (2017) Development of percutaneous endoscopic lumbar discectomy (PELD) technology in china. J Spine 6: 374. Yeung AT, Yeung CA, Salari N, Field J, Navratil J, et al. (2017) Lessons learned using local anesthesia for minimally invasive endoscopic spine surgery. J Spine 6: 377. Yeung AT (2017) In-vivo endoscopic visualization of pain generators in the lumbar spine. J Spine 6: 385. Yeung AT (2017) The role of endoscopic surgery in the treatment of painful conditions of an aging spine: A state of the art. J Neurol Disord 5: 372. Yeung AT (2017) Endoscopic decompression for degenerative and isthmic spondylolisthesis. J Neurol Disord 5: 371. Yeung AT (2018) The Yeung endoscopic percutaneous selective endoscopic discectomy (SEDä) and lumbar decompressive technique (YESSä). J Spine 7: 408. Yeung AT, Vit K (2018) Transforaminal endoscopic decompression of the lumbar spine for stable degenerative spondylolisthesis as the least invasive surgical treatment using the YESS surgery technique. J Spine 7: 407. Yeung AT, Vit K (2018) Transforaminal endoscopic decompression of the lumbar spine for stable isthmic spondylolisthesis as the least invasive surgical treatment using the YESSä surgery technique. IJSS. Yeung AT, Lei Qi (2018) Treatment of foraminal and spinal stenosis by a visualized endoscopic transforaminal technique under local anesthesia. J Spine 2: 1. Copyright: ©2018 Yeung AT, et al. This is an open-access article distributed under the terms of the creative commons attribution license, which permits unrestricted use, distribution, and reproduction in any medium, provided the original author and source are credited.